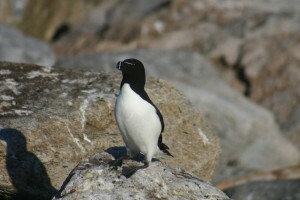 Matinicus Rock is a sea-bird colony. 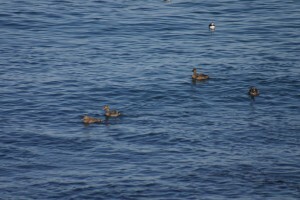 This means that lots of sea-birds, including Puffins use this area to nest at this time of year. The land is near their food supply and is free from many land-based predators. There is little else living on the island besides the birds and grasses that you find here. That does NOT mean the island is free from predators all together. There are many birds who will eat either other species of birds or their eggs. Still it is safer here than it is closer to shore. The island has neighborhoods, just like New York City does. Certain birds live in a neiborhood. 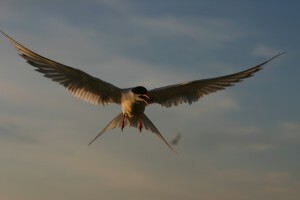 Arctic Terns nest in one area, common terns nest in another. Terns lay their eggs on rocks and grass towards the top of the island. Puffins and Guillemots live down in rocky borrows closer to the shore. In fact, sometimes Puffins and Razorbills can share the same hole!! 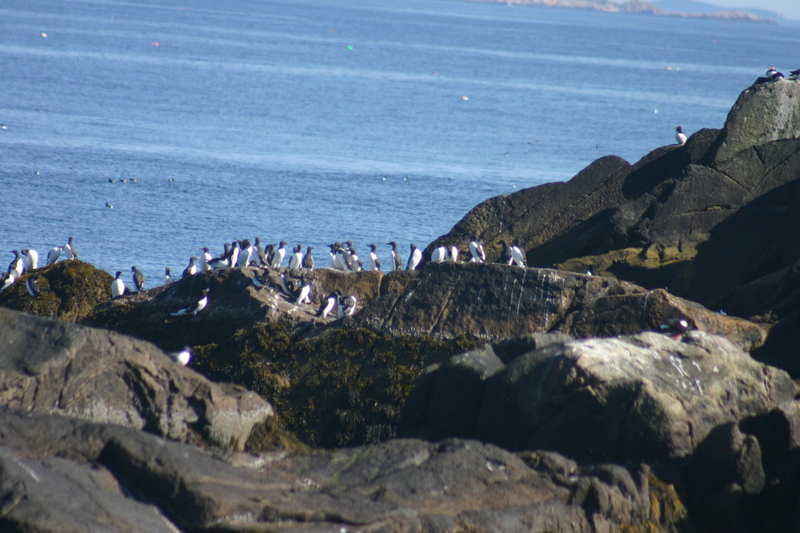 Besides Puffins, who you know, let’s get to know some of the other residents here. 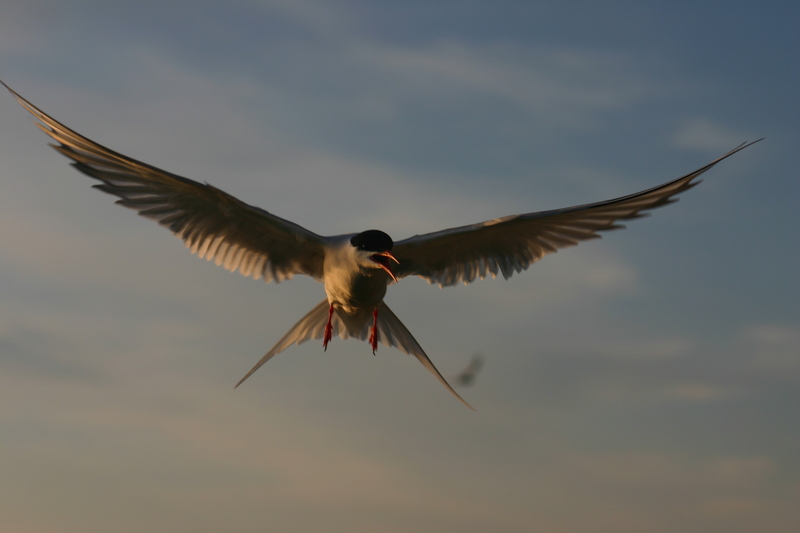 Arctic Terns are a small bird with a pointy red bill. You would never know that this little bird migrates all the way Antarctica and back each year! They migrate further than any other bird in the world. They do this by making several very long fights. Then they stop to feed on their way, feed very little as they travel. Would you like to see how they defend their nests when I walk nearby? Click here for a video. Common Terns are very aggressive terns that were long-hunted for their feathers, which were used in hats. 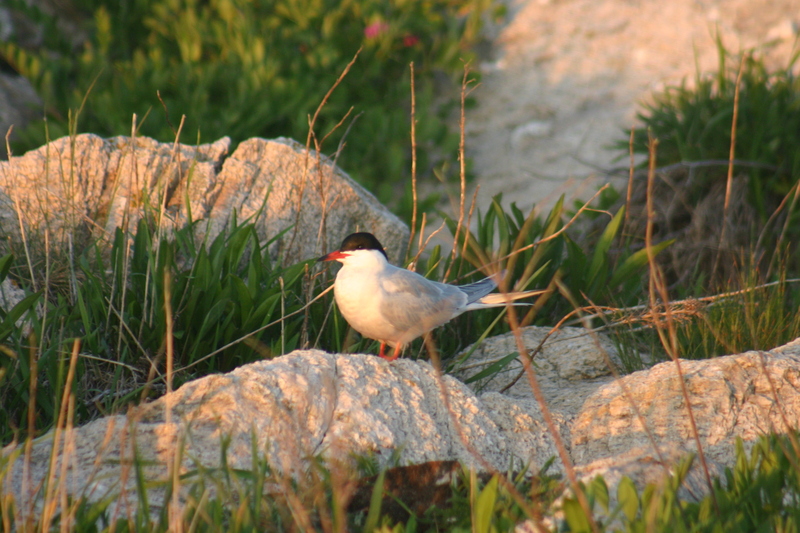 Common terns were one of the first success stories of the conservation movement, which helped to bring them back. Eiders are a species of bird that looks very much like a duck. Here is what their nest look like. As soon as these birds are born, the chicks run right to the sea. All the babies will gather together and all the mothers will stay with all the babies until they are old enough to fend for themselves. 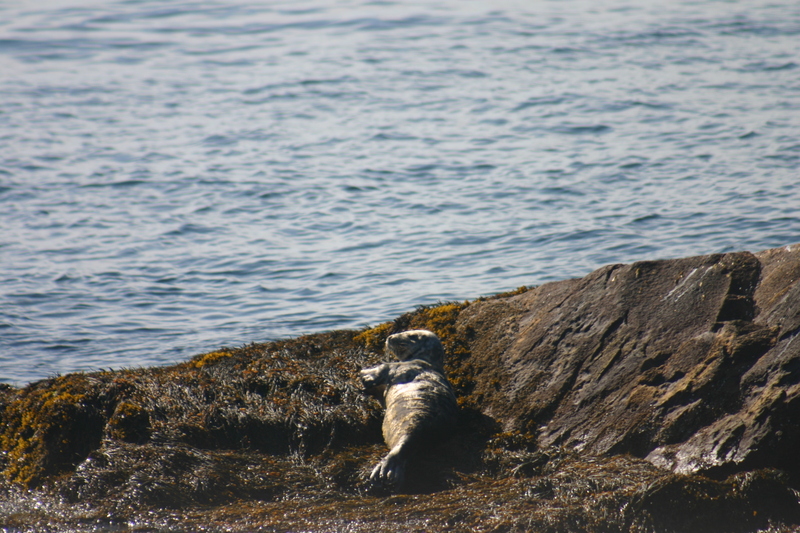 Yesterday a Grey Seal came by to rest and sun himself on the rocks near shore. This one “hauled out” for a few hours and seemed to enjoy himself (or herself) very much. When Razorbill babies hatch, they only stay in the nest for 18 days or so. Then the males call them out of the nest to go to sea. The father cares for them in the water until they are old enough to take care of themselves. Unlike most birds in their family, Guillemots do not go far out to sea. 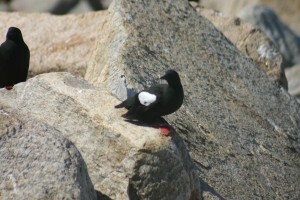 They stay around the island and pick their food out from the rocks under the water near shore. They nest in shallow rock crevices near the shore. Here is one of the Gulls on the island. By the way, scientists do not say seagull, they just say gull. Many Gulls live in lakes or rivers, not the ocean. Does this gull look like the ones that live near us? Probably not. There are many different species of gull. This one is called a laughing gull because of the cackling sound that it makes. The other species of gull that are found here commonly are Great Black-Backed Gull and Herring Gull. 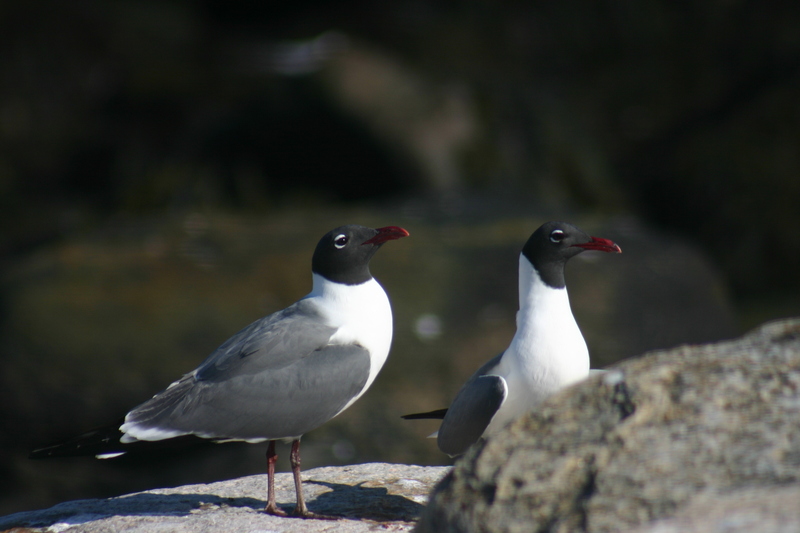 The gulls are clever scavengers and they tend to eat the eggs of the terns and the puffins. The scientists here need to keep the gulls away from some of the species we are trying to protect. Murres nest on tall rocky cliffs. 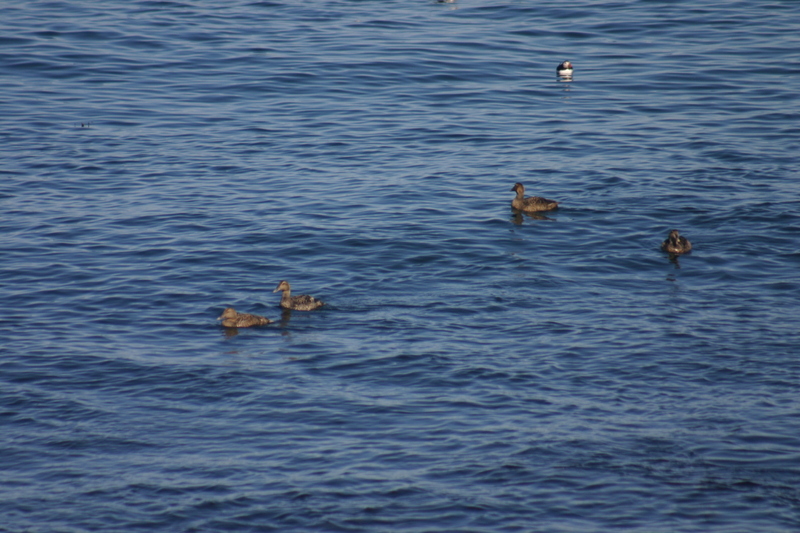 When their chicks are old enough to leave the nest and go to sea, the males will help them to the water. But since they next along cliffs, it often means the little ones have to jump off the cliffs to get to the water. Sometimes it is a very long way down. The father helps them in the water while the mother guards the nest so it can be used again in future years. Did you find out the answers to yesterday’s questions? If not, find them today. You can also post questions for the scientists here. What would you like to know about this bird colony? Question of the day: Why do you think birds live together on this island? •	I think that so many birds live together on the same island because its less likely for you to be eaten because the predator will most likely eat something else. It is an advantage to live together because you can learn more about how to live there from there parents, and the disadvantage is that its SMALL and that means there’s less living space. •	I would like to know if birds can shed there feathers and at mating season they can get a brighter color to draw attention to them? I think that so many birds live there because that’s where the perfect temperature is to lay there eggs. The advantages are the birds that are predators have food. The disadvantages are the birds that are female prey don’t get to lay there eggs if they haven’t gotten to lay there eggs. What I’d like to know about this seabird colony is do you see it interesting that so many birds are living together in harmony? Do birds from different species fight with each other? I think they go to the same island because maybe there’s a lot of fish and what they need to survive. The advantaged is they have fish and water to survive on the island. I would like to know how many puffins have you seen on the island so far? Are puffins noisy? about how long do they live? I think so because they all want to be on that island together. The advantages are that if a prey comes they can all fight it off together. The disadvantages are their would be less food. Do they all protect each others babies? 1. I think so many birds live there because there used to be a few and then they laid eggs and they kept reproducing and reproducing until they had that much. The advantage for scientists is that there are more birds to study and observe. The advantage for the birds is that there are more mates so they could lay more eggs. The disadvantage for the scientists is there is bird poop probably everywhere. The disadvantage for the bird is that it’s getting too overcrowded. 2. The question I have to ask is do you think you will discover more bird species? If you do what kind? 1. I think that so many birds live together so it is safer for their babies. This way the predators will not eat them or take them away? 2. Why do the bird go crazy by fling all around. I think that all of the puffins nest together because they need to reproduce and need to let there babies remember there birth place. I think one advantage for the bird are that most likely they will never get extinct. I also think one disadvantage for the birds is that it would get to crowded. How many types birds did you see so far? Much space .they won’t take up space .No disadvantages. 2).Why does the horn go of every 30 seconnds? 1 I think some many bird you over there because that place is save and lay egg I think they because they can lay there egg. It is bad for the bird because some people can sold the egg. 2 I want to know why is the bird so noisy and crazy because they are fly around. I think so many species of birds are living together because theses no room to have their own nesting area .So they share nesting areas .They have an advantage because instead of one adult protecting the babies theses two adults of different species. It will be better then one adult. 1. I think a lot of birds lay their eggs because they don’t have homes to live in. 2. The advantage to so many birds living together because people put to much houses to live in. I think it is good to be with a lot of birds because then they would have what they need to survive. The advantage is they have what they need to survive on the island. I would like to know how many puffins you saw. Are puffins noisy? About how long do they live? 1. I think so many birds lay there eggs on the same island because maybe one bird came laid eggs and then another bird came then more and more came that’s how so many birds are there. 2. The advantages to so many birds living together is some birds might die off because some birds are taking to much food and some might not get as much so some can die off. 3. One disadvantage is they all have to play with no mater what kind of bird it is. 4. One question is from your estimate how many birds of your best species do you think are there. 1. I think so many birds from different species nest are together on the same island because it will be faster getting food, I think the advantages of birds living together are to keep them safer since there are so many it is harder for predators to get all of them. The disadvantages are there might not be enough space for them in the future. 2. 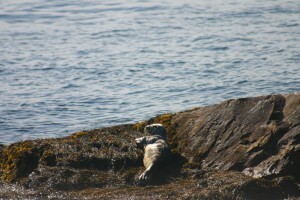 Have you seen seals eat puffins or any other kind of animal ? I think so many birds live together so the larger birds can have food. One advantage is birds can have more food. A disadvantage is there is less bird on the island. About how many birds did you see? I think so many birds from different species nest together for warmth. Also it is good weather for birds. Some advantages to so many birds living together is some birds can go get food while others watch out for their nests and watch over their babies. Some disadvantages of so many birds living together is some birds may eat other birds. Out of all the different kinds of birds which one would be the most dangerous? Do some of the birds guard the nests of other birds if they are away from their nest? I think that so many different types of birds nest together because they’re safe from predators. An advantage with so many birds living together is they can protect each other. One disadvantage with so many birds is they would have to fight for a place that they could nest. Have you every seen two different species nesting together? Do different species ever have babies to form a completely new species? 1. I think so many birds from different species nest together on the same island because its good to stay together and share food and rest to be healthy and safe from other predators. The advantage of so many birds living together is to try to find food together in different places. The disadvantages are if there is more birds and no food to find they all die. My question is how do the puffin survive if there is no food? I think so many birds from different species nest together on the same island because the island that all the bird species live on is by the water so the birds either go in the water like puffins or they have a lot of space to fly above the water. The advantages of a lot of birds living together is that all of the bird species could all get to do there own things together. The disadvantages of having a lot of birds living together is that if two or more species that live together fight a lot that is not a good thing. I have a question about your trip with the puffins. My question is out of all the bird species which one do think is most interesting? I think that the birds live on the island together because they can all get what they need if they live together. Some of the advantages of the birds living together is they can protect each other from predators. One of the disadvantages is that if two of the species eat the same thing then there might not be enough of that kind of food for all of them. Here is my question… How can you tell the difference between a male puffin and a female puffin? I think that there are so many different types of birds nest together on the same island because maybe there are only one nest and they also maybe they can either live next to water like puffins or birds. The birds live in the nest because so they can protect their self or then they are going to fight a lot with puffins because they want to share the nest in the island because there is on one nest in there. I have a question for you. Have you seen different species together which one do u like more in there in all of those? I think so many birds nest at the same island because it has good weather conditions for them and, the land is good for setting their nests. The advantages to living on the same island are they can all get the food the need, and they can stay with their families. The disadvantages with living on the same island are that some of the birds will eat the other birds, and that people will start to know where they are nesting and start to get them. What birds eat most of the other birds? Why do all the birds choose to nest on that island? Question 1.They nest together because probably they get a long very well they are birds but they are big and small birds. They don’t look alike that’s why I think they nest together. The bad things about different species of birds is that they could fight with each other or they could eat each other eggs that is the bad things about birds. Question 2. What would I like to know about puffins is that do they fight each other. Also why do puffins live on that island. That’s what I would like to know about puffins. I think that many birds nest on the same island because a puffin and a arctic tern can beat gulls. 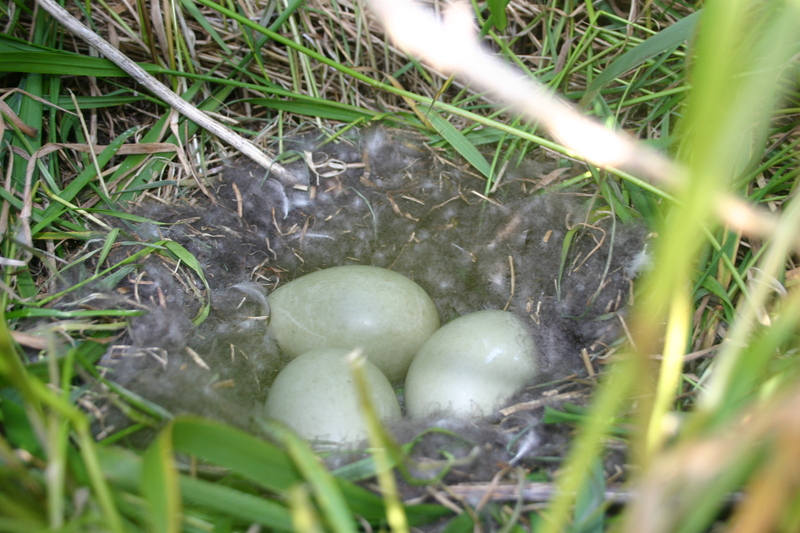 The disadvantages are if an arctic tern gets hungry it would eat the puffins egg’s or if the puffin got hungry it would the eat arctic tern egg’s. How did they endangered species? 1. I think so many birds from different species nest together because they can learn to get a long with more birds. The advantages are, when a predator comes it has less of a change of caching anything because it goes against more birds. The disadvantages of nesting together are that island is small and it might be really crowded. 2. Something I would like to know about the colony of those seabirds are do all puffins get along with other puffins? Do they get along with other birds? I think so many birds nest together because they can help protect each other if one bird is in any sort of danger. An advantage of so many birds living together is good because you can help protect you one another if they need help getting food or trying to hide. 1 disadvantage would be if one bird tries to eat another bird or another bird’s eggs. One thing I would like to know about the species of the birds are have you seen any of the birds fighting or interacting with each other? I think so many birds nest together because there are not many predators there. The advantages are that they are all living together nice, that they don’t fight with each other and they help each other. The disadvantages are their eggs maybe get eat in by other birds. Why do you have a fog horn? I think different species nest together because the island has nice weather for the animals. The advantages to so many birds living together are they are not prey of any of the birds. Disadvantages I can think of are the birds might get over hunted. Mr.Tanenbaum I would like to know why do the male birds call the baby birds them out to sea. Where are the moms? 1. I think so many birds nest to together because they are the in the same species. 2. The advantages living together are good because they have their own the island so they are protected. 3. 1 disadvantage is if they fight over food. I want know how many birds live there??? I think so many birds nest together because there is water there and they can drink it when they need to. The advantages are they have a lot of power with all of the animals so it will be harder to get eaten. One disadvantage is that it would be harder to get food because ever bird is going after the same thing. What was the reaction when the birds saw you? I think so many different birds nest together because you can help them in any sort of trouble or danger. One advantage is that they could help each other out if they needed help or find food. One disadvantage is if a bird tries to take its food or take a egg and eat it. What I would like to know about species is that would they do to each other????? Do they get along or do they fight? I think so many birds would nest on the same island is it has all the things they need to live. I think the advantages are the sea birds have to just dive in the water because it’s right in front of them. It also gives them protection and there’s a good chance of them not being eaten. The disadvantages are the fog horn, it’s scaring the birds because goes off a lot. Mr. Tanenbaum what is the affect of climate change for the puffins does it make any effect on the puffins? I think birds from different species nest together on the same island because the birds that eat other birds wouldn’t have something to eat somewhere else. I think it is good to have all the birds living because if the birds did not all live together there would be no birds eating other birds and there would be too much of one kind of bird. It is not good to have all of the birds nesting together because if one species of bird eats all of the other species of bird there will only be that species left. One thing I would like to know is how do the different species of birds interact with each other? 1. I think many different birds from different species nest together on the same island because they like the weather there. Also, there is probably more food to eat there. 2. The advantages to so many birds living together are that they might protect each other from prey headed for them. 3. The disadvantages to so many birds living together is that they might have a fight between each other about food or taking something that’s theirs. 4.Do the moms ever call them out to the sea? I think so many different species of bird nest on the same island because the island is probably a good food supply for all the bird. It also probably has the right materiel for all there nests. The advantage of so many birds living together is if there is not enough food they can eat each other. The disadvantages are there probably wouldn’t be enough food for all the birds. My question is, are you going to continue this next year. If so what do you plan on doing anything different? 2. Bad for so many birds living together because they can get eaten by other birds. 3. Why do birds eat other birds. Question 1. Many birds nest on the same island because it’s a good nesting ground for many birds. One advantage many birds are living together is because maybe if a predator comes they can all fight together like a team to keep their babies safe so they can’t get eaten. One disadvantage is that so many birds eat each others eggs. Question 2. What I would like to know about this seabird colony is how many birds live on this small island. Mr.Tanenbaum how can a bird jump from a cliff without getting hurt? Do any of the birds die when they jump off? I think so many birds live in the same area because it has a lot of good resources for them and it might be a very good place to nest. One advantage to living together is that they can defend themselves together. How do all they birds stay on the rock? How do they remember where it is for the next year? Do all the babies come back to the same place? I think that so many birds from different species nest together because they can help each other on the island. The advantages is are that a group of birds could fight off predators together. One disadvantage is that if two kinds of birds eat the same kind or fish they will start to fight for the food. I would like to know what would happen if one of a bird’s wife dies? Will one of the other mothers adopt it? Do the scientists ever raise the orphaned baby chicks? 1.I think so many types of birds live on the same island because there is not enough hawks on the island to swipe out all the chicks. 2.The advantages of birds living together is if a hawk comes they help at everyone by alerting them. 3.The disadvantages are if none of the birds see the hawk the chicks can get eaten. Would a mom or dad puffin ever leave its chicks alone?? Do other moms help their neighbors with their chicks? I think that different species nest together is because the island is big enough for the birds to all nest together. The advantage is that all the birds can group up and protect each other. The disadvantage is that when they fight and not look that the hawk is coming the hawk will eat the chicks. I want to know if they work or don’t work with each other to defend each other or their chicks. Do different species of birds ever interact? I think so many birds from different species nest together because they could take care of each others baby chicks and if a bird tries to eat them not much will get eaten. The advantages of so many birds living together is good because they could help each other look for predators. The disadvantages are if all the birds are looking for predators the baby chicks will get eaten. When the razorbill father is at the nest where is the mother razorbill? I think that so many birds from different species live together because they can help each other out and maybe all of them like the inland. there are some advantages for all the birds to live on the same inland such as if there is a bird coming all the bird can yell to set a alarm to help all the birds know there is something coming. There some disadvantages are one of the birds on the inland might eat your chick. What do female razor bills do while the male take care of the baby’s. I think so many birds from different species nest together because it provides everything they need, the right weather. The advantages of so many birds living together is because if one of the parents needs to go out and get food for the others one of the other parents can watch her chick. The disadvantages are that every one of the puffins can take up to much room for all the others. How do humans effect the Puffin colony? Do the puffins get upset when the scientists try to band their chicks? 1. I think so many birds lay on the same island, because the parents probably want young birds to meet other bird species .The advantages of the birds living together is good, because they can help each other look for predators. One disadvantage is if all the birds eat the same thing there will be none left so they might eat their eggs. 2. I would like to know how you tell a female puffin from a male puffin. 1. I think the entire nest in the same island because it will be easy to eat another bird chick if there so much. The in vantage is to help look for predators by sending sigh that some thing evil here. A disadvantage is a big hawk might eat your baby when the entire adult is looking for food. 2. Does the color of the beak of a puffin change if the puffin eats some thing badly for them? I think that different species of birds nest on the same island because most predators can’t get there. One advantage is that there are fewer predators. One disadvantage is that there might not be enough food for all of them. How do you get rid of the Gulls who eats the Puffins’ eggs? 1 I think they are able to get along. One advantage is enemies attack they can they work together to scare them off. One disadvantage is they are fighting hawks can eat them. 2 How do you scare off any animals that try to eat birds? Do the scientists run around trying to scare the predatory birds away? 1. I think so many birds live on the same island because there is not enough room on other islands. If they lived alone there predator could eat them all and then there would be no more puffins. 2. The puffins neighbors good help them with there chicks. 3. I would like to know if puffins watch there neighbors chicks? I think that so many different species of birds nest together because they probly fight or protect them selves. The dad protect babies chick from danger while the mom is protecting the nest, but the bird yell to the other birds about danger. Does the mom go find food in the ocean for their chicks. I think that scientists should study other birds because if they only looked at one bird, then they would think that every other bird lived just like that. For example, if they just studied puffins, then they would think every other bird lived in the cold and just ate fish. If they just studied parrots then every other bird would live in tropical areas, and so on. What was the most amazing experience you had on that island with the puffins? When did you first find the puffins? What is the most annoying animal there? I think that so many birds live there because there are good conditions such as the temperature and food conditions. I think scientist study birds because they can learn from the past like they did from the pterodactyl. Do puffins get sick if a human touches it?